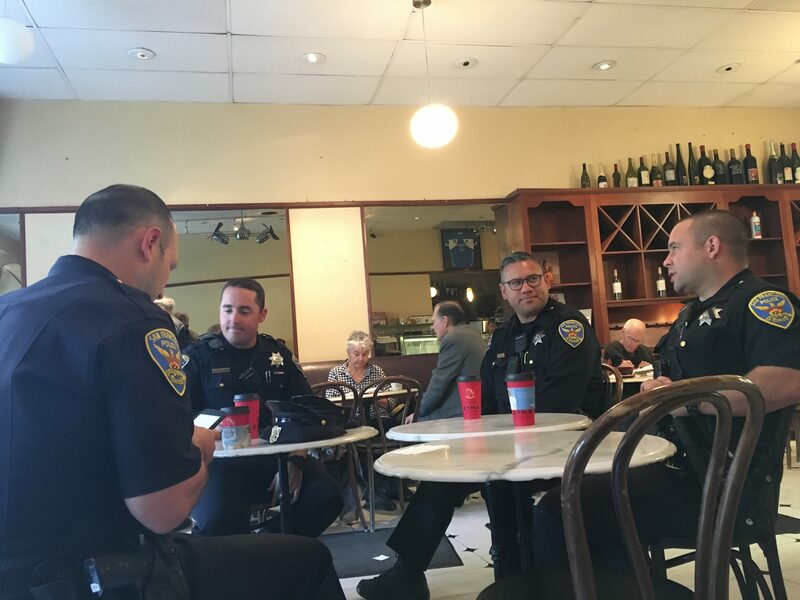 Officers Viet Ha and Joseph Dal Porto were prepared to have coffee with the residents of the Tenderloin who wandered into the Peet’s on Market Street when a woman approached them. It was a not-so-perfect start to Coffee with a Cop, a National Day across the country, and a citywide event in San Francisco with officers from each of the 10 district police stations. They sat in places like Peet’s, Starbucks, Philz and other local cafés to meet the residents they serve. And although few of the latter actually sat down for a long conversation, some did have questions about recent murders and foot patrols. Many were pro-police, but they also said that the ritual is not without merit. Gruenwedel wanted to know what the officers knew about the double homicide in Dolores Heights. “What about the increased presence of beat cops in and around the Mission?” Gruenwedel asked. Kaprosch said he would be seeing more beat cops on lower 24th, and upper 24th in Noe and the Castro. At Cafe Roma on Columbus Avenue, five SFPD Central District officers sat in a circle as community members made their own circle nearby. Jokes and casual conversation filled the room. David Gladstone, a writer from North Beach, joked that his “crew” and the cops were on great terms. “But I don’t know about the left-wingers,” he said. Officers Galligan and Kelly are the foot-beat officers at Fisherman’s Wharf, and they often stop at Cafe Roma to talk with people while they patrol the area. “Around here, a lot of us have coffee with cops every day,” said Gladstone. “People know the cops from all these cafés around here,” he said, indicating to the other cafés with a sweep of his arm. At Corridor Restaurant where SFPD Northern District officers filed in, Capt. John Jaimerena noted that it was a crazy week for his district because one of the officers at the Northern station, Vinnie Etcheber, lost his wife, Stacee, at the shooting in Las Vegas. The community members at Corridor were mostly pro-police and police acknowledged that. “The people that are here like us,” said Officer Lynn Ponatto. If community members aren’t pleased with the police, they’re unlikely to jump at the opportunity to sit down for coffee with officers, she said. The conversation was mostly police officers talking among themselves. This seemed to be the tone throughout the morning. Officers said that 9 a.m. on a weekday is a difficult time to get people to slow down, stop and have a conversation. Nonetheless, some walked by and shook hands with the officers. “Thanks for all you do” was often part of that exchange. Just as often, people stopped to ask police for directions. “I am not sure who is in charge of spreading the word, but at least we are here,” said Officer Valerie Durkin. Back in the Tenderloin, resident and officer exchanges were also slow. Officers Ha and Del Porto had returned from the incident at BART. They waited outside Peet’s for people to engage in conversation. Officer Matt Loya said another coffee with cops event will be held on Oct. 25 at 835 Larkin St., and would likely be more popular because that location is at the corner of three districts: the Tenderloin, the Central District and the Northern District.